Do you only care about the NCAA tournament because you want a look at the best players in the upcoming NBA draft? Wonderful news. You are in the right place. Here’s a handy viewing guide for March Madness. A note before we get started: The numbers represent players’ placement in the latest DraftExpress Top 100 Prospects rankings and all times are ET. “There may never have been a 15-seed that looks like Detroit,” Butler coach Brad Stevens told ESPN’s Jason King about the Horizon league champions. With a former McDonald’s All-American (and the coach’s son) manning the helm in Ray McCallum, and three terrific athletes in Doug Anderson, Eli Holman, and LaMarcus Lowe in its frontcourt, Detroit matches up as well as any mid-major opponent in this tournament from a physical standpoint. 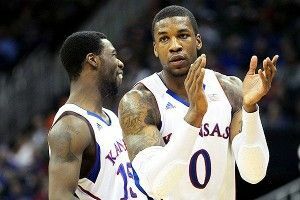 The two best NBA prospects on the floor will be from Kansas, though. Player of the Year candidate Thomas Robinson — a likely top five draft pick — is one of the toughest and most athletic players in college basketball, and he’ll represent a major challenge for Detroit’s big men. His matchup with highly productive Eli Holman will be closely scrutinized. Tyshawn Taylor is an NBA athlete who can run a team, create his own shot, and make jumpers from the perimeter. He’s steadily improved his draft stock all season and will be expected to carry a heavy offensive load as the primary ball handler in Kansas’s offense. Of particular interest will be how he performs in pressure situations during the tournament. His questionable decision-making skills (on and off the court) have held back his draft stock over the past four years. Lehigh will be severely overmatched from a talent perspective against Duke’s army of former McDonald’s All-Americans, but they do have one matchup that could cause a lot of problems on the perimeter. Combo guard junior C.J. McCollum is one of the top scorers in college basketball, and Duke has struggled this season guarding players who can create shots at will, make 3-pointers, and get to the free throw line at a high rate. How will McCollum handle the much bigger, longer, and more athletic defenders he’ll encounter here now that he’s outside the cozy confines of the Patriot League? A strong showing could surely give McCollum’s NBA draft stock a boost, either this spring or headed into next season. Also worth watching is the way talented, but at times erratic, freshman Austin Rivers handles his first NCAA tournament game. Rivers is Duke’s most creative ball handler, and the Blue Devils will need him to be aggressive offensively while still playing within the flow of their offense. No player improved his draft stock as much as Andrew Nicholson this March. The senior big man carried his St. Bonaventure squad to an automatic NCAA tournament bid nearly single-handedly, displaying his versatile offensive game and shot-blocking prowess in the process. He’ll have an extremely difficult matchup against Florida State, though — they’re one of the best defenses in college basketball, featuring a long, physical, athletic shot-blocker in Bernard James, who is almost six years his senior. The Seminoles do a great job of slowing the game down, fronting the post, and denying opposing big men like Nicholson touches, which could make this a long night for the Canadian. Keep an eye on swingman Michael Snaer, the MVP of the ACC tournament this past weekend. A former McDonald’s All-American, he’s come up big in plenty of games for Florida State and has the physical attributes, defensive prowess, and perimeter shooting ability to pique the interest of NBA scouts. One of the most productive big men in college basketball, Mike Scott has carried Virginia this season, and will be expected to continue to do so in the NCAA tournament. His matchup with sophomore center Patric Young will be fascinating on both ends of the floor, as the two are diametric opposites in terms of style of play. Scott is an ultra-skilled power forward who can score inside the paint but can also step outside and make jumpers, while Young is a chiseled center with a limited skill set who can be an absolute load to handle inside the paint on both ends of the floor. Scott is nearly four years older than Young, and nowhere near as physically gifted. But none of that really matters in a setting like this. Also keep an eye on freshman guard Bradley Beal, a likely top 10 pick should he elect to enter the draft. He’s been fairly inconsistent this season, particularly with his perimeter shooting, but he’s an incredibly smart and versatile player who displays most of the characteristics scouts like to see in a young prospect. A fascinating matchup awaits us here at the power forward position. In one corner we find Doug McDermott, a first team All-American and one of the most prolific scorers in the NCAA. In the other is JaMychal Green, a long, athletic, energetic big man who blocks shots and spearheads one of the top 10 defenses in college basketball. No one questions McDermott’s skill level. He is an excellent shooter who has a knack for establishing deep post position and scoring with terrific touch. What scouts wonder is whether he can continue to do so against NBA-caliber defenses, as he’s undersized and not especially athletic for a power forward prospect. A strong showing against Green and the entire Alabama defense can help ease some of those concerns. On the other hand, Green has quite a bit to prove in his own right, as he’s coming off a prolonged suspension (the third of his career) and has not had as good of a senior year as some might have hoped. Every game from this point could be the last of his career, so obviously the urgency will be very high. NC State Is Delighted to Be Here!